Ceremony and Cocktail Music, Uplighting, Photo Slide Show, Signature Gobo Lighting, Photo Booth, and More! – Photo Booth (Open Air or Enclosed in Your Choice of Black or White). 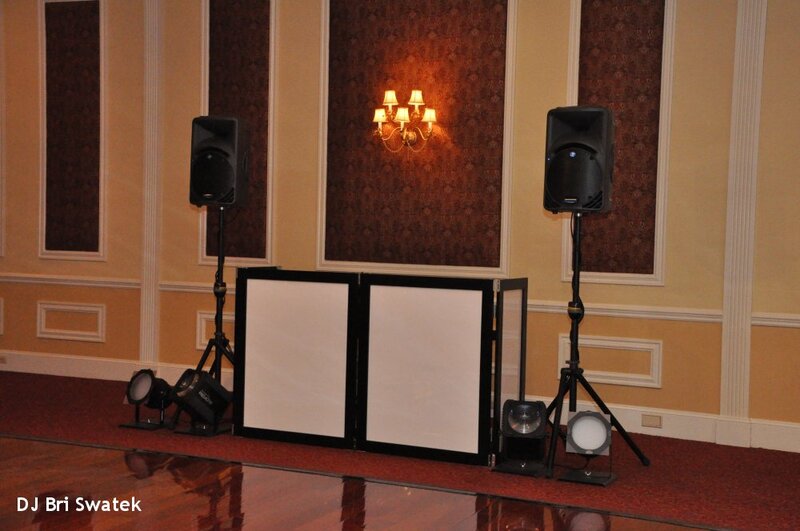 DJ Bri Swatek offers a variety of sound, video, and lighting systems to fit your unique style. Go big or keep it simple–the choice is yours! 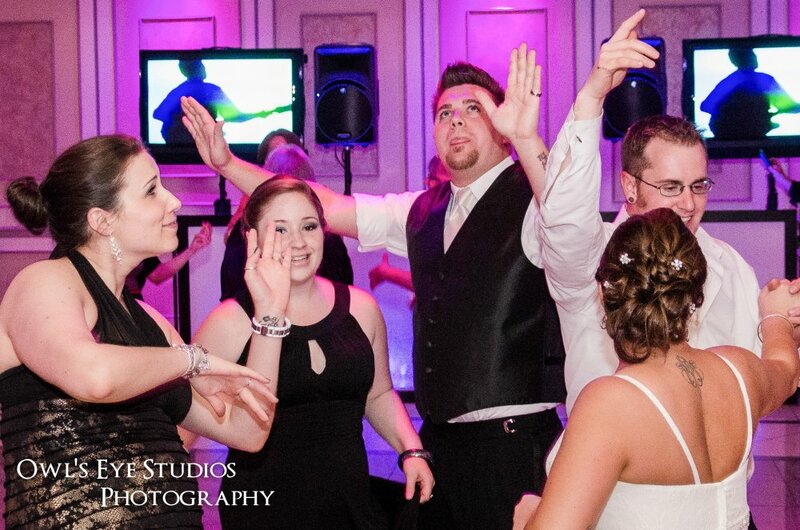 Using only the best professional equipment, DJ Bri is ready to meet your wedding celebration’s needs, including state-of-the-art digital sound systems and wireless microphones, video, projection, and lighting systems, and more. Appropriate volume is continuously monitored throughout your wedding reception to create an enjoyable time for all of your guests. If you’re thinking about adding additional lighting to your wedding venue, DJ Bri offers a number of options from ambient lighting over the dance floor to dynamic, sound-activated lighting effects. 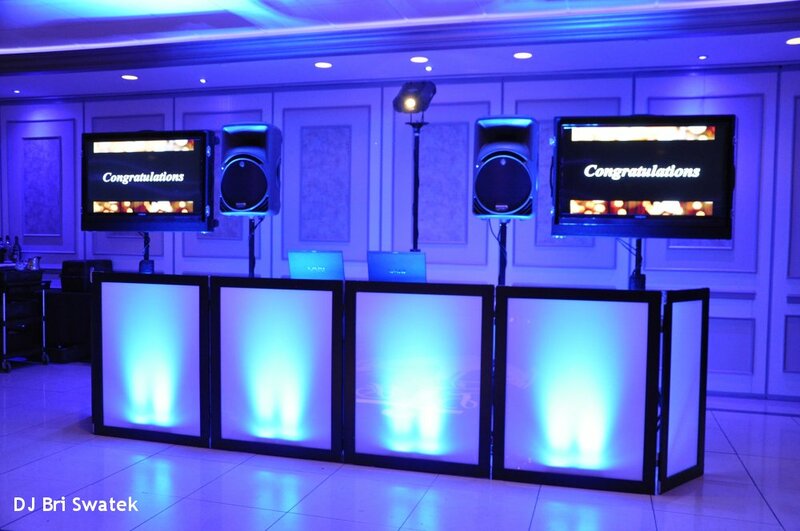 The DJ booth can be kept white or lit to coordinate with your wedding colors. Uplighting to enhance the look of your venue or signature gobo lighting to personalized your dance floor are available as well. 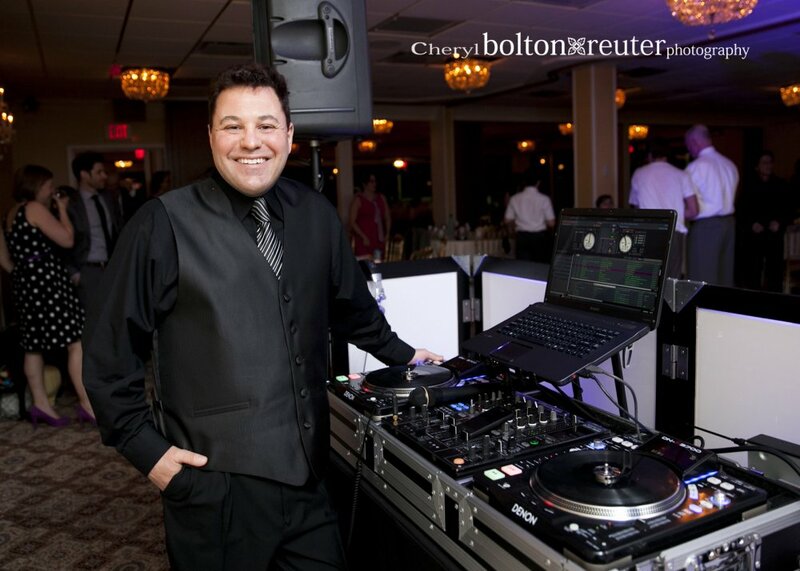 In addition to complete DJ / MC services and a variety of lighting choices, DJ Bri also offers multiple sound systems for on-site ceremony and cocktail hour, complete photo slide show services, photo booth recommendations, and much more! All of DJ Bri’s professional DJ equipment is fully insured for liability and completely backed-up on-site during your event. All of DJ Bri Swatek’s clean, radio-edited music is purchased from high-quality, professional sources. DJ Bri guarantees a highly organized performance with fast response to requests and great sound quality throughout your wedding reception. DJ Bri’s music library contains tens of thousands of songs in a wide variety of styles. DJ Bri subscribes to Promo Only, “The Industry’s Complete Source for Music.” Each month, DJ Bri’s library of music is updated with the latest Radio and Club Hits (including Pop, Dance, Rock, and Hip-Hop), Latin Hits (including Salsa, Merengue, and Reggaeton), and Country Hits. 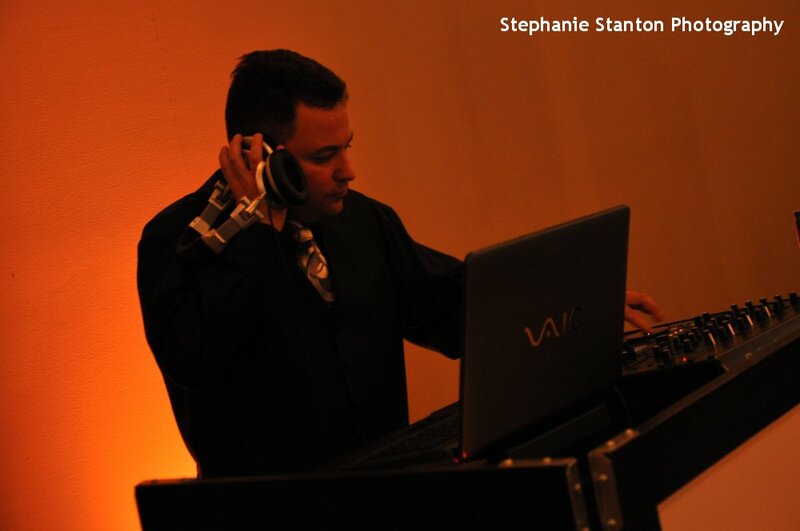 As part of your wedding-planning process, DJ Bri will provide you with regularly updated song lists prior to your event. DJ Bri will be more than happy to find music to fulfill your specific song requests. Background music during cocktail hour, dinner, and dessert can be completely customized to fit your personal taste. Looking for a way to share your unique style with your friends and family at your wedding? 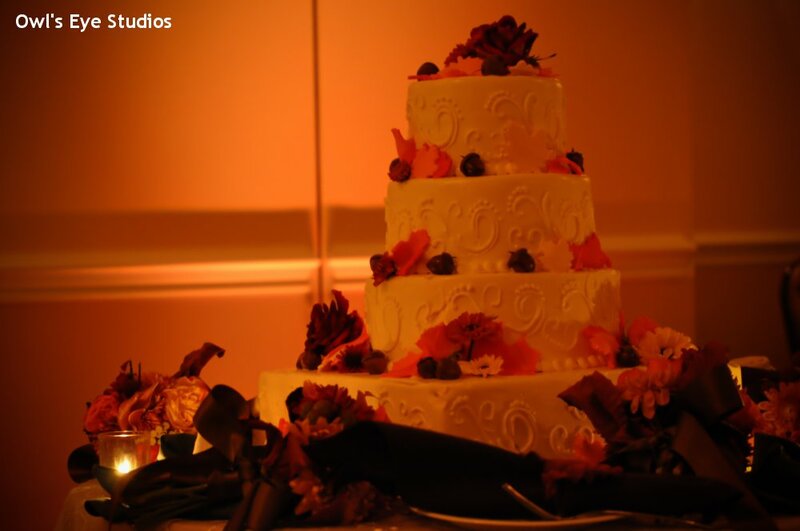 Consider using elegant, ambient uplighting to enhance the look of your unique Hudson Valley wedding. DJ Bri Swatek, offers a variety of uplighting services and ideas to match your wedding’s style and colors, as well as lighting to accent the look of your Hudson Valley wedding venue or location. All of DJ Bri’s uplighting fixtures are battery-powered, wireless LED lights which take up little room at your wedding venue, while creating a dramatic effect. With endless color choices, walls, columns, or other features at your location can be enhanced at your wedding with uplighting. 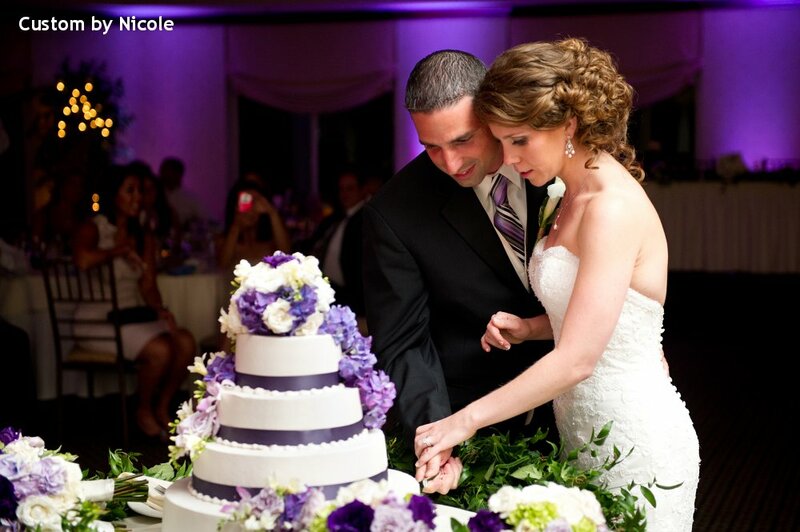 Consider uplighting colors that coordinate with your wedding’s style . . . or use uplighting to create a dramatic effect. Share your memories with your friends and family on your wedding day! Using your pictures and favorite songs, DJ Bri Swatek can create a Memory Montage / Photo Slide Show looking back on special people and moments through the years. Or, supply DJ Bri with your own custom-made photo slide show if you prefer. DJ Bri can provide your choice of Flat Screen LCD TVs or a Projector and Screen to display your Memory Montage or Photo Slide Show during your wedding for all your guests to enjoy. Say it with lighting! 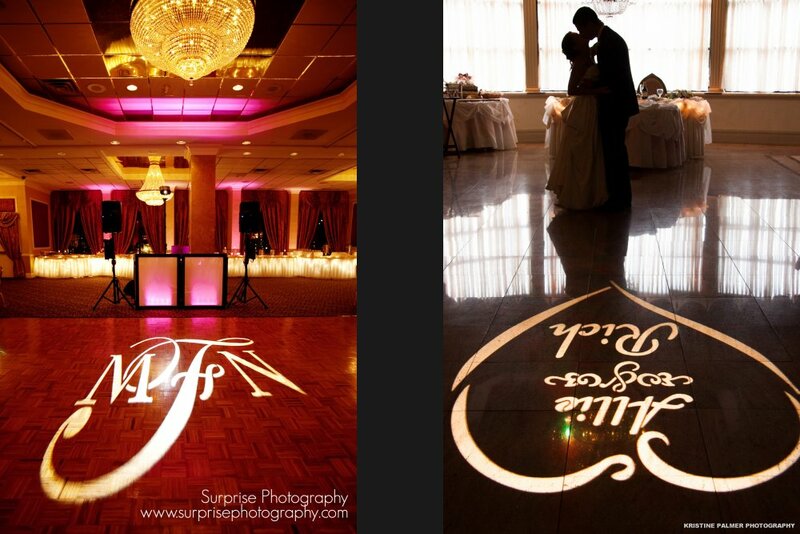 Using DJ Bri Swatek’s Signature Gobo Lighting service, project your names, monogram, wedding date, and / or any other message or artwork at your wedding. DJ Bri will work with you to create unique, custom-made Signature Gobo Lighting to achieve any effect you want on the dance floor, wall, or ceiling at your reception venue for your wedding celebration. Looking for a unique way to share your style with your friends and family on your big day? Consider adding the fun of a photo booth to your wedding celebration! 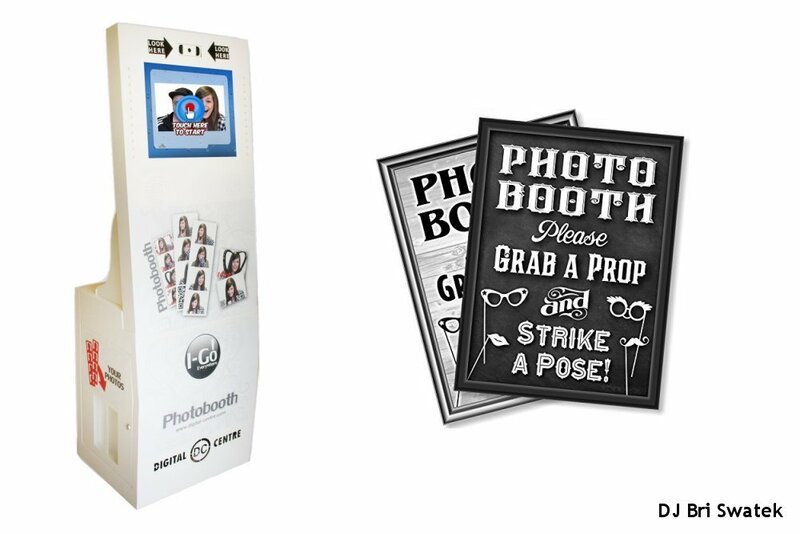 – Professional photo booth attendant throughout your entire event. 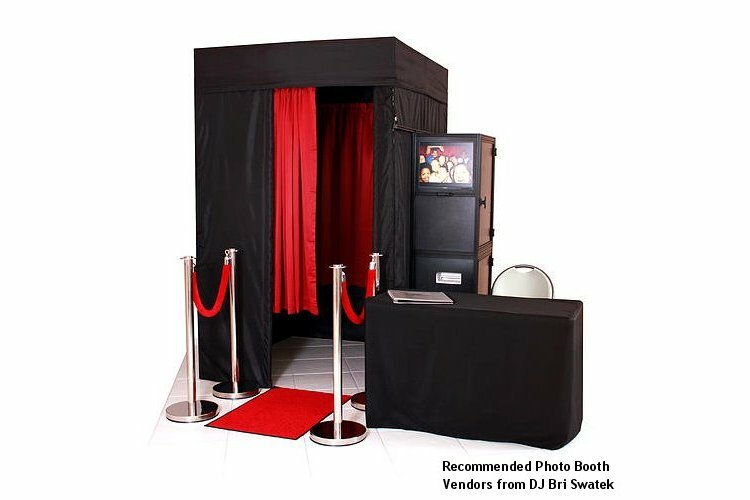 – Your choice of an enclosed or open air photo booth. – Two sets of photo strips: one for you and one for your guests. 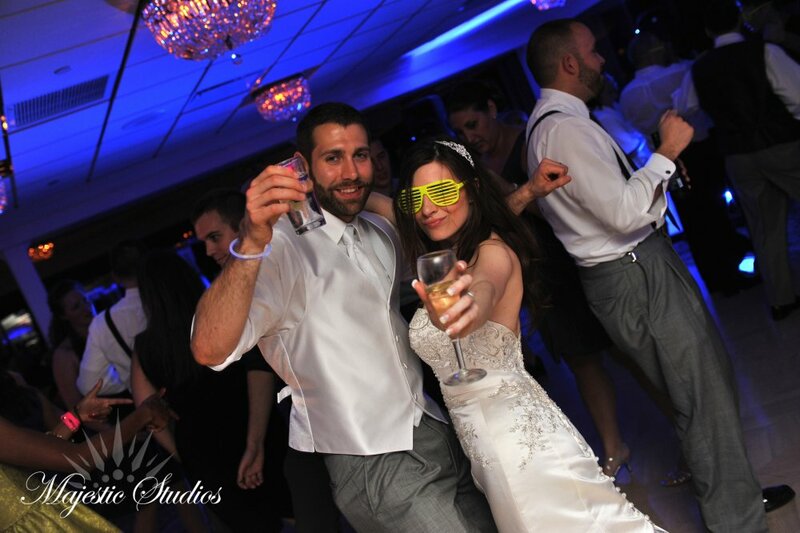 – Your custom event name and date printed on each photo strip. – Digital copies and / or a scrapbook of all your photos at the end of the event. – Standard party props included. – Custom party props available by request. Add once-in-a-lifetime memories on your wedding day with a photo booth! 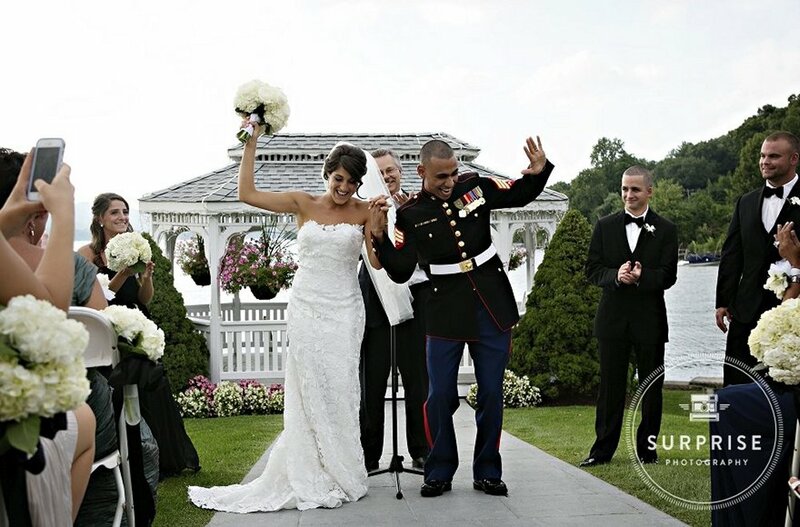 For more highly recommended professional Hudson Valley wedding vendors and services, including reception venues, caterers, officiants, musicians, photographers, videographers, florists, transportation, and more, contact DJ Bri Swatek, Spinning with Style or visit DJ Bri’s Blog: Your Unique Hudson Valley Wedding.